Enjoy these Pretty Flower Patterns! Row 1. dc in 5th ch from hook, *ch 1, skip 1, (dc-ch1-dc) in next ch -v-stitch made: *repeat from across: (16 sts) V-stitches made, turn. Row 2. ch 3- counts as dc, 5 dc first ch-space, *sc in next ch-1 space, 6 dc in next ch-1 space- shell st made: repeat from*. ending 6 dc in last ch-1 space- 16 stitches, shells. fasten off, leaving long tail for anchoring Rosette. Starting at that end, roll first shell tightly to form center bud: anchor at base of shell with 2 sts. Roll remaining strip to form Rosette. Then secure by stitching in and out through layers of foundation ch at bottom of Rosette. rnd 1. bpsc around round 2, *ch 5, bpsc around the next sc, *repeat until you have 5 bpsc (chain 5 spaces), sl st in the beginning sc. rnd 2. *ch 1, 9dc in the ch 5 space, ch 1, sl st in the previous sc space, *Repeat until you have 5(9dc pedals), sl st in the beginning chain. Next flower: use pink color yarn, sl st in the new color. rnd 1. bpsc in the first sc post, *ch 5, bpsc, *repeat until you have 5 bpsc, sl st in the beginning chain. rnd 2. ch 1, 9 triple crochet in the ch 5 space, ch 1, sc in the previous sc, *repeat until you have 5(9 triple crochet), sl st in the beginning chain. 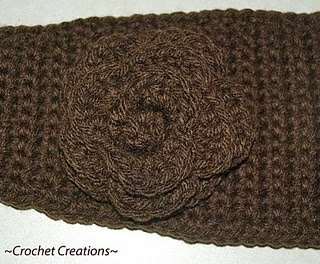 fasten off and sew onto the headband. rnd 3. *ch 1, do 6 dc in the chain 3 space, ch 1, sl st in the previous sc space, *repeat until you have 6 pedals in the chain 3 space. fasten off and attach to dress. weave in the ends, your dress should be around 14-15 inches long in length. ch 2, slip stitch in the 2nd chain from the hook, this creates a ring. 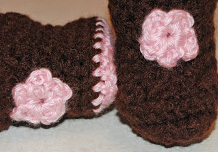 *ch 2, 2 half double crochet in the ring , ch 2, slip stitch in the ring, *repeat 5 times to create a small flower. Optional, I used a glue gun to glue in rhinestones in the center of the flowers. Rnd 1 Ch 5, *sc in ring, ch 3, rep from * 6 times. Join with sl st to 2nd ch of beg ch. Place marker for beg of rnd. Slip marker each rnd. Rnd 2 *[Sc, hdc, 3 dc, hdc, sc] in next ch-3 sp, rep from * 6 times. Join with sl st to beg sc. Rnd 3 Sc through back of sc of Rnd 2, ch 6, * sk next sc, sc through back of next sc of Rnd 2, ch 6, rep from * 5 times. Join with sl st to beg sc. Rnd 4 *[Sc, hdc, 5 dc, hdc, sc] in next ch-6 sp, rep from * 6 times. Join with sl st to beg sc. Rnd 5 Sc through back of sc of Rnd 4, ch 6, * sk next sc, sc through back of next sc of Rnd 4, ch 6, rep from * 5 times. Join with sl st to beg sc. Rnd 6 Rep Rnd 4. Fasten off. Start with Pink yarn ch 5, join round with sl st. rnd 1. 10 sc in the loop, join with the beginning sc with a sl st. rnd 2. Switch to purple yarn, sc in the same stitch, *ch 3, skip the next stitch, sc in the next st., *repeat until you have 5(3 chain spaces) rnd 3. *sl sl in the chain 3 space, ch 1, work 6 dc in the chain space 3, ch 1, sl st. in the previous sc, *repeat until you have 5(6 pedals) sl st.
Second pedals: Pink yarn rnd 4. *bpsc, ch 5, bpsc, ch 5, *repeat until you have 5(5 chain spaces) sl st in beg stitch. rnd 5. *ch 1, 9 dc in the chain 5 space, ch 1, sl st. in the previous sc, *repeat until you have 5(9 pedals) sl st to finish. Third set of pedals. purple yarn rnd 6. *bpsc, ch 5, bpsc, ch 5, *repeat until you have 5(5 chain spaces) sl st in beg stitch. rnd 7. *ch 1, 9 triple crochet in the chain 5 space, ch 1, sl st. in the previous sc, *repeat until you have 5(9 triple crochet pedals) sl st to finish, fasten off and weave in the ends, attach to the hat. H hook, White yarn or Whatever yarn you prefer. (First Petal) Ch 2, yarn over and pull your yarn up, yarn over and pull up two more times in the same stitch, (total of three times) and yarn over and insert your hook in the next stitch, yarn over and pull your yarn up two more times, (total of three times in that stitch), then yarn over and pull through all loops on the hook. Chain 2. *Ch 2, yarn over and pull your yarn up, yarn over and pull up two more times, (total of three times) and yarn over and insert your hook in the next stitch, yarn over and pull your yarn up two more times, (total of three times in that stitch), then yarn over and pull through all loops on the hook. Chain 2. Insert your hook with the chain 2, and slip stitch in that next stitch. *Repeat for each petal. At the end Slip stitch in the last petal. Fasten off and Weave in the ends. All explained in the video. ch 4, sl st to create a ring. 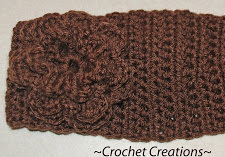 Optional, slip stitch a contrasting color. 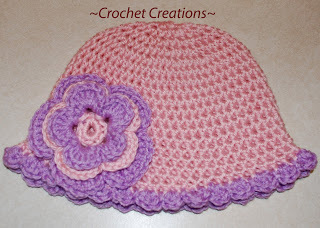 Here is an easy pretty Daisy pattern with videos to follow along with! 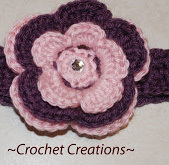 This flower is a nice accent and can be made for a hair accessory. Rnd5: *sc in with your white yarn, chain 9, sc in the 2nd chain from the hook, hdc in the next ch, dc in the next 3 chains, hdc in the next 2 chains, sc in the last chain, slip stitch in the same stitch as the beginning sc, slip stitch in the next sc for the next petal, *Repeat for each petal around. Fasten off, Weave in the ends.